This week's Blitz of the Week was submitted by Blitzology reader Anthony White. Anthony shot me an e-mail with an overview of the blitz and a video clip. 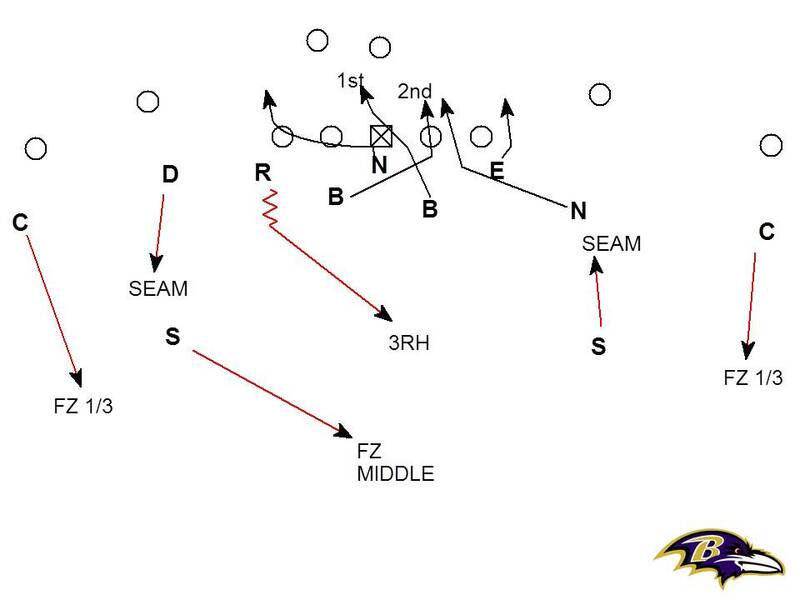 The pressure is a strong side overload blitz with Fire Zone coverage behind it that was run by the Baltimore Ravens against the Carolina Panthers earlier this season. The Ravens bring 4 rushers from the strong side to generate pressure. The video of this blitz is available here. Click OK and the video will start. Note the outside-in Seam technique of the inverting safety to the blitz (#26) and how he squeezes the inside route by the #2 receiver to the 3RH player (#56). Excellent find Anthony and thanks for the e-mail.